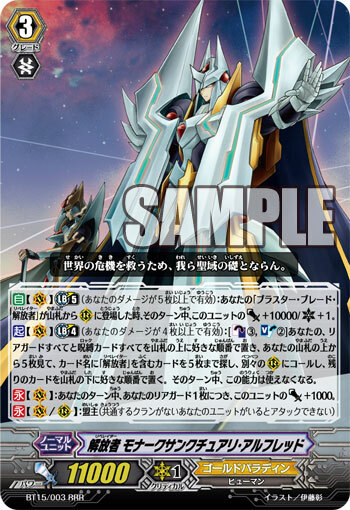 [AUTO](VC) Limit Break 5 (This ability is active if you have five or more damage):When your unit named "Blaster Blade Liberator" is placed on (RC) from your deck, this unit gets [Power]+10000/[Critical]+1 until end of turn. [ACT](VC) Limit Break 4 (This ability is active if you have four or more damage):[Counter Blast (3) & Soul Blast (2)] Put all of your rear-guards and locked cards on top of your deck in any order, and look at five cards from the top of your deck, search for up to five cards with "Liberator" in its card name, call them to separate (RC), and put the rest on the bottom of your deck in any order. This ability cannot be used for the rest of that turn. Alfred: "In order to save the world from this crisis, we shall become the foundation of the Sanctuary." Blaster Blade: "The light of courage shall illuminate the future. Shine forth, Blaster Blade! " The crown of the nation of United Sanctuary, the one who leads the knights, and he who wears the armor of a true king: Alfred, the King of Knights. Before the onslaught of the Ultimate Doomsday Weapon, Omega Glendios, even the mighty Salvation Lion, Ezel, had to turn his tail and run. United Sanctuary and the rest of Cray were on the verge of being swallowed by the vortex of despair once more. However, while Void had created a new "Despair", a new "Hope" was born in the land of United Sanctuary. 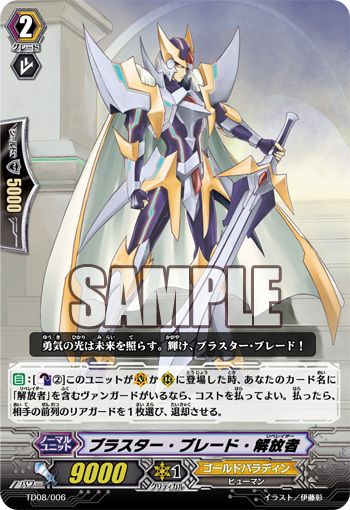 The King of Knights charged to the battlefront with Blaster Blade by his side, clad in the proof of the Messiah and Savior, the armor that can only be worn by a king who has vowed to become the foundation of his country for the rest of his life... ... The armor of the One True King: "Monarch Sanctuary". As the knights found themselves broken free from Glendios' Omega Lock, a new flower of hope sprouted in their hearts and souls. Feeding on that hope, everyone rose to their feet. The People, The Sanctuary, and all of Cray has entrusted their fates to these two saviors. "Let us ride forth, Blaster Blade. To save everyone." "Yes, my Lord. We shall risk our lives to bring peace to Cray once more." The general term for those chosen from the second standing army of United Sanctuary, "The Gold Paladins", they are the few that the King of Knights has entrusted with the mission of protecting not only the Sanctuary, but the entire world of Cray. They were named the "Liberators" because they liberate all who have been ensnared by the schemes of the wicked. Those with the title are said to be the guiding hand of the new era. At the center of the group are the young warriors who saved the day, known as the "Gold Paladins", but some of their number are battle-scarred veterans who were handpicked for the job. As of today, Japanese unit lore profiles online will cease. They'll be in the Monthly Magazines as the novel entries about Cray.